From an engineering perspective, a mine is simply a machine for turning energy into Gold. The energy has to come from somewhere. In the earliest days of the Gold rush, human muscle supplied the energy to dig gravel and slosh pans. 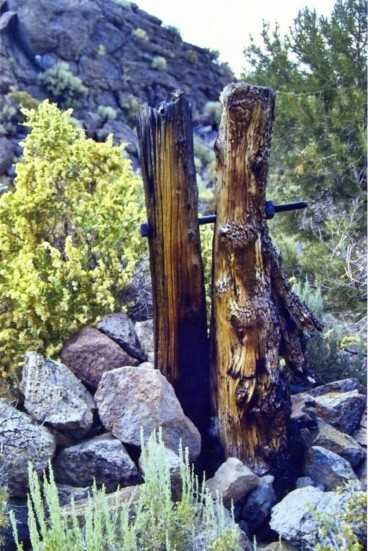 As the easy Gold was worked out, water-power was used to wash away hillsides and operate sluice boxes. But the really valuable gold deposits were in Quartz veins that ran underground - the "Mother Lode." Energy was required to lift the ore from underground and pound it into fine dust so the Gold could be removed. The Bodie deposits were found in a desert area at 8300 ft. elevation, where winter temperatures were 30 degrees below zero. 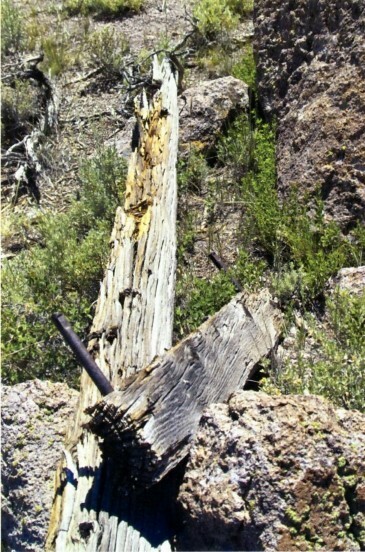 Firewood was transported many miles on muleback from forests near Mono Lake. The wood was burned for heat, and to run steam engines that supplied energy to the mines and mills. But the forests were not limitless, and wood became increasingly scarce and expensive. 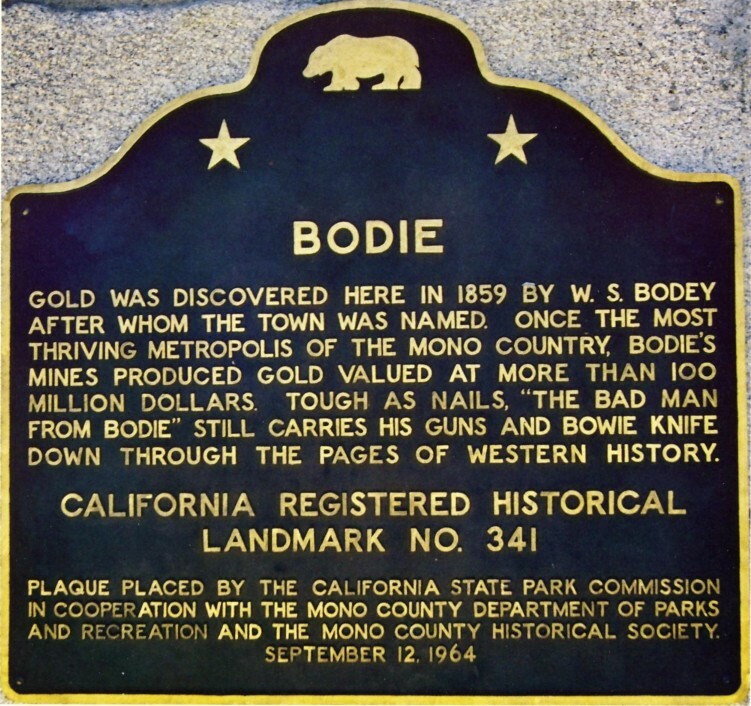 The Standard Consolidated Mine was the largest operation in Bodie. Its 20-stamp mill was powered by a steam engine that required 7 cords of firewood each day. By 1892, wood was so scarce that its high price materially affected the profitability of the entire operation. Thomas H. Leggett, superintendent of the mill, had followed recent electrical developments and was convinced that hydroelectric power, generated in the Sierra foothills 13 miles away, could be economically transmitted to the mine. 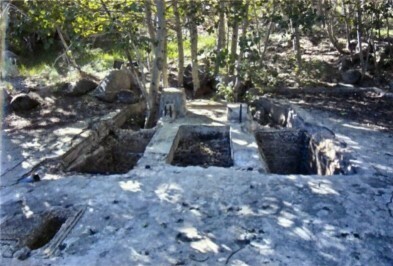 He convinced the mine owners, and the project was undertaken. An earth-filled dam was constructed across Green Creek to form Dynamo Pond. An earth ditch cut into the hillside carried the water nearly a mile to a point 355 ft. above the power plant. The plant itself contained a single Westinghouse generator driven by two 21-inch Pelton water wheels. The dam has long since been breached, but the major part of it still stands, and can be seen in the photo below. The roadway to the left follows the course of the old ditch. All that remains of the power plant is the foundation and some sheet metal. The wheel pits are clearly visible. 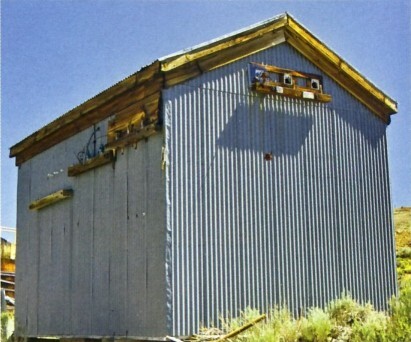 Power was transmitted to this transformer house at the Standard Consolidated mill. The system was originally single-phase, but was upgraded to three-phase at a later date, for which we found evidence on the line as well. 160 horsepower was transmitted 13 miles at 3.3kV. We are fortunate to locate an article by Leggett that describes the project in great detail (Transactions of the American Institute of Mining Engineers, vol. 24, p. 315, 1894). That paper contains the line map shown below. The map also contains a quite complete synopsis of the plant and line specifications, and a parts list of the line material used. It is accompanied by the following description: The line crosses extremely rough country, not 500 yards of which is level beyond the town-limits. 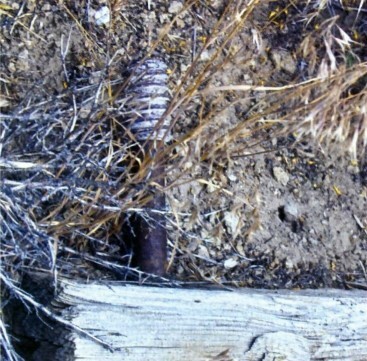 Most of the ground is very rocky, over 500 pounds of dynamite being used in blasting the pole-holes. 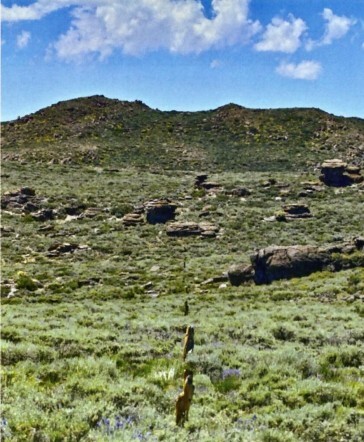 All the Bodie books that mention the line have the following comment: The poles were installed in a straight line, as it was feared that the electricity would not be able to turn comers. There is no indication in the article that any such misconception was held by Leggett or his engineers. In fact, the line runs over some steep ridges that cause abrupt changes in direction of the wires vertically. So the statement shows the ignorance of the writer rather than that of the line builders. The line crosses a number of very steep ridges (from 300-800 feet in height) and on these the wire necessarily pulls heavily an the top pole, and especially on its pins and insulators. 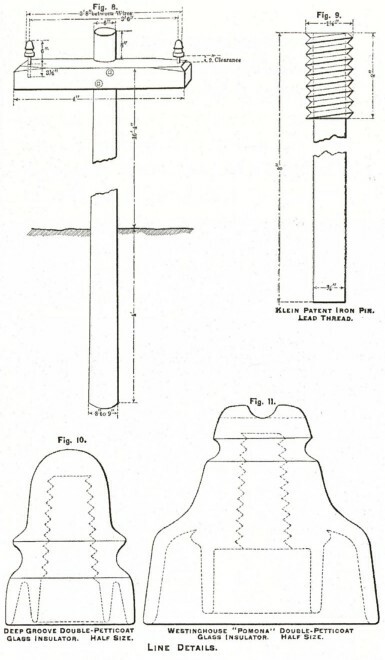 In all such places the ordinary double-petticoat insulators were replaced by the large "Pomona" insulator, Fig. 11, on which the wire is carried in a groove across the top, and its weight is therefore directly down upon, and in line with the center of, the pin. Of course the possibility of finding even a piece of a Pomona excites us greatly. We know where to look: they would have been used on the pole sites atop the steepest ridges, all of which were indicated on the map. We also want to ascertain when the line had been converted to three-phase, and to what extent the original pole structure had been preserved until the line was wrecked. So off to the line we go, starting west from Bodie toward the highest point on the line. Within an hour we locate pole stubs heading in the right direction. Most of them are stripped completely bare: not a tie-wire, bolt, pin, or shard of glass. Too close to town; let's press on. The route gets rougher as we gain altitude; maybe we'll get lucky. Here is a crossarm in pretty good shape, and it has two bolt heads in it. Let's turn it over and see how they did it. The poles are of round tamarack timber, 21 feet long, 6 inches in diameter at the top, set 4 feet in the ground; poles 25 feet long being used through the town, and along the line wherever there is danger of deep snow-drifts. They are placed 100 feet apart, and fitted each with a 4- by 6-inch cross-arm, boxed into the pole, and held by one bolt and one lag-screw. Sure enough, this is an original arm - wow! We have never seen the one-bolt-one-Iag-screw combination on any other power line, so this is a great start. A few pole sites later we find a crossarm with the two original iron pins still in it, but the lead threads missing. Apparently the threads had stuck in the insulators when they were being unscrewed, and so the bare pins were left behind. By now the country is getting really rough, so we expect to find more stuff. Sure enough, here is a crossarm with the original solid-iron pin still in place, complete with lead threads. Wow! Still as good as new after 113 years! 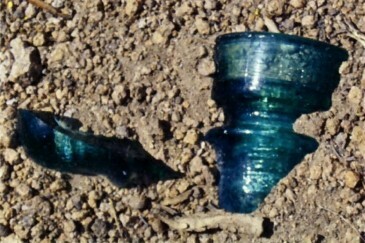 We occasionally see a few shards of glass near some of the pole sites, but nothing to excite an insulator collector. Exactly what deep-groove double-petticoat insulator did they use on this line? And where did they all go? Most lines have some whole ones left behind - what happened here? Perhaps when they got to the ridge they would have become less diligent about carrying all the stuff out. Barb speculates that they kept a count of all the line material, and had to return each insulator even if it was broken. That speculation continues to be our best guess for why we can never get all the pieces to fit a broken insulator together - we keep climbing higher. The next pole site is surrounded by the most amazing display of desert flowers we have ever encountered. And there, 6 ft. from the stub is what looks like a whole insulator. Hmmm, it is certainly a wide-groove double-petticoat one, so it fits Leggett's description all right. On closer inspection, it is split in half. Fitting the two halves together reveals its identity: a CD 162 version . Its dome is embossed in an arc "W. BROOKFIELD / NEW YORK" with "PAT. FEB 12TH 1884" on the front skirt. Not a rare insulator by any means, but at least we know what was used on the original line. We are not far from the ridge by now, and our excitement grows as we climb. This is the highest point on the line. It is very steep on both sides, and will certainly be a pole site that originally used Pomona insulators. 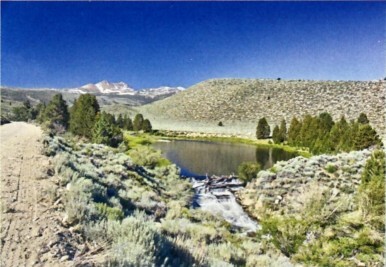 As we break over the ridge we are greeted by a spectacular view of Mono Lake. Recovering from the view, we search the site carefully. A few shards of ice-blue glass are all that remains. Disappointing, but we have 10 more Pomona sites to find and search. We look west across a broad valley sloping to the south. The ridge on the other side looks as high as this one. We pull out the topo map and find our location. We are at the place Leggett's map shows as the highest point on the line, but our elevation is 8710 ft., not 9000 ft. as Leggett indicates. Yet another puzzle to unravel. We are a long way from the truck, and it is getting late. The broad valley and ridge on the other side will have to wait 'til another day. We continue to wonder about the conversion to three-phase. One day it all becomes clear - we find a pole top that is complete and original - it could be in service today. The arm is boxed into the pole, just as Leggett had described, and it used one lag screw and one bolt. But they had nailed a side-pin to the top of the pole! So that was how they supported the third wire. And the nails are round, indicating a later origin than the square nails we found in the crossarms. The insulators they had used for this later addition were ice-blue Locke CD 287.1, which bore a patent date of May 22, 1894, so they couldn't have been original on the line that was built in 1892. 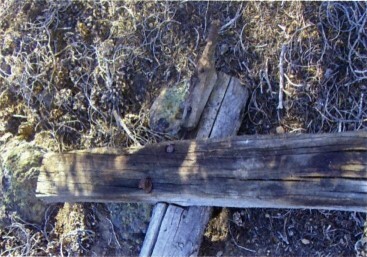 When the underground portion of a Tamarack pole rotted, a new stub of Juniper was dug in alongside, and bolted to the standing pole with 3/4 in. steel bolts. We are imagining the crusty old linemen, faithful mule loaded up with new stub and tools, trudging up the rocky hillside to the site of a leaning pole. A lot of digging with bar and shovel to get the new stub in the ground. Then he takes out his auger and bores a hole, one turn at a time through both stub and pole. He drives the bolt all the way through, and runs up the nut, not too tight yet. He augers one more hole through both pole and stub, nearer the ground this time. The auger is harder to use this close to the ground, but he moves some rocks and manages to get through. After a bit of prying the holes line up enough to drive the second bolt through. Once both nuts are thoroughly tightened, this pole is straight and strong. Good job! Time for a beer at the Sawdust Corner Saloon! Each day we find another place to intercept the line, and then begin to search for pole stubs. We had drawn a straight line on our map from Bodie to the Green Creek Plant. We soon realize that, contrary to all the stories, the line is quite far from our straight line in several places. The route has been very carefully chosen to make installation and maintenance as easy as possible. Subtle changes in direction allow the line to run through valleys and natural passes that make the actual route much more hospitable than a straight route. We develop great respect for these Mining Engineers. Leggett tells us that the rare CD 244 "Pomona" insulators were used on ridges where the line dropped abruptly. These are the same units that were used a year earlier on the San Antonio Canyon line to Pomona and San Bernardino, CA. They were supplied by Westinghouse, and were made of "clear flint glass." 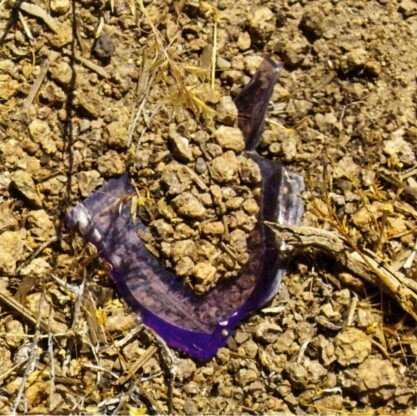 The few that have been recovered are all purple, presumably from exposure to the sun. There are twelve sites that we identify for possible Pomona use, most of which are shown on Leggett's map. 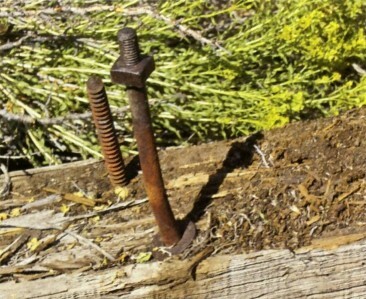 The vast majority of the sites along the line are completely clean, often even the bolts and nuts have been taken away. Occasionally there is a tie wire, bolt, or shard of glass. 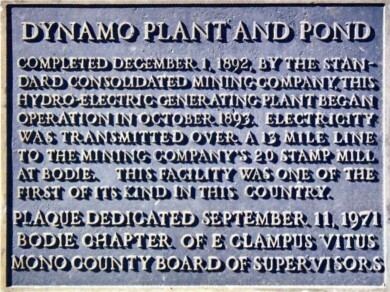 The Pomona sites are no exception, in spite of their more rugged surroundings. 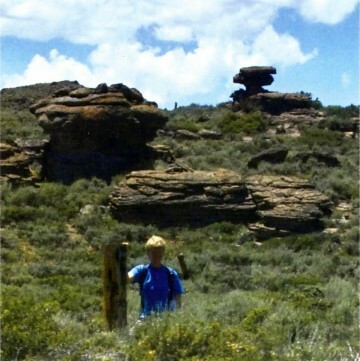 In the middle of a high, sloping valley is a rocky ridge. Barb is standing patiently, waiting for Carver to get done taking pictures of the pole stub. "Look at That." 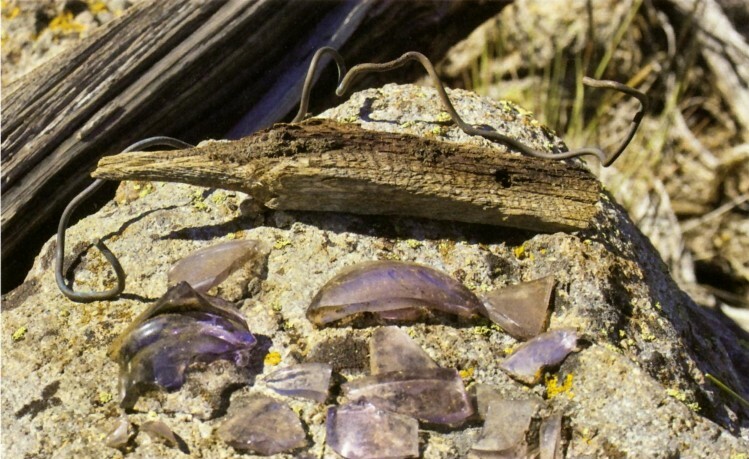 Sure enough, there in the dirt is a purple shard of glass the first sign of a real Pomona insulator. The size and shape are right. We dig the entire area, and come up with a few more small shards. 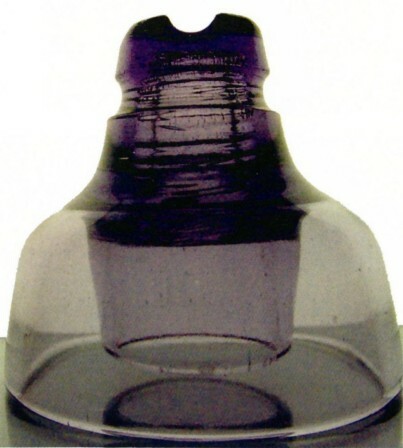 The main body of the insulator is simply not there. They took it away. Each day we get to one or two potential Pomona sites. By the time we have visited them all, only three have any Pomona pieces. Of those, the most complete set of pieces we find is shown below. Not enough to glue together, but enough to know the entire history of this most amazing historic power project, straight out of the Wild West!